The latest system based addition to the At a Glance series, The Gastrointestinal System at a Glance is a concise and integrated text on the gastrointestinal system. The book is intended as an authoritative and concise account of the field covering anatomy, physiology, biochemistry, pharmacology, and pathology as well as clinical management. The book is divided in to four sections: Basic Structure and Function, Integrated Function and Disorders and Diseases as well as a short section on Diagnosis and Treatment. The structure of the book takes the student from the basic sciences to clinical practice whilst always maintaining an integrated balance and understanding of both aspects. Fantastic diagrams that include a quick summary of clinical presentations will aid students to learn and revise. 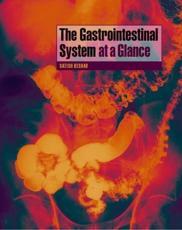 The Gastrointestinal System at a Glance is ideal as an introduction to the subject, as a companion book for a course, and as a book for revision prior to examinations.